Since January 1, 2004, all Canadian organizations engaged in commercial activities have been required to comply with the Personal Information Protection and Electronic Documents Act (“PIPEDA”) and the Canadian Standards Association Model Code for the Protection of Personal Information incorporated by reference by PIPEDA. 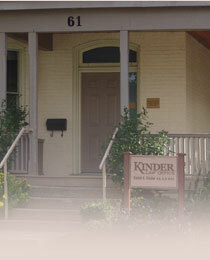 These obligations extend to lawyers and law firms, including Kinder Law Office. As a law firm, we also have professional and ethical obligations to keep confidential the information we receive in context of a lawyer-client and agent-client relationship. Personal information is information about an identifiable individual. Personal information includes information that relates to their personal characteristics (e.g., gender, age, income, home address or phone number, ethnic background, family status), their health (e.g., health history, health conditions, health services received by them) or their activities and views (e.g., religion, politics, opinions expressed by an individual, an opinion or evaluation of an individual). It does not include the name, title, business address or business telephone number of an employee of an organization. 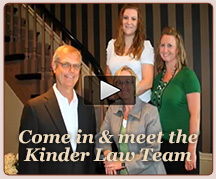 Our organization, Kinder Law Office, includes lawyers, clerks, and support staff. We use a number of consultants and agencies that may, in the course of their duties, have limited access to personal information we hold. These may include process servers and delivery agents, real estate conveyancers, computer consultants, marketing consultants, office security and maintenance, accountants, a file storage company, temporary workers and summer students, credit card companies, collection agencies, website managers, cleaners and other lawyers. We restrict their access to any personal information we hold as much as is reasonably possible. We also have their assurance that they follow appropriate privacy principles. Like all lawyers, we collect, use and disclose personal information in order to serve our clients. For our clients, the primary purpose for collecting personal information is to provide legal advice and services. Where our client is an individual, we collect information about the client’s legal issue including anything the client might have done or said that might affect their legal situation so that we can advise the client as to their legal rights and responsibilities, their options for addressing the issue and then to carry out their instructions. A second primary purpose might be to collect personal information from third parties about a client’s legal issue so that we can ascertain how the third party’s perception of events can affect our client’s legal situation. A third primary purpose is to obtain home and other personal contact information so that we can contact the client at their convenience or in an emergency. A fourth primary purpose is to identify and to verify the identity of the client, which is an obligation for lawyers under the by-laws of the Law Society of Upper Canada. For individual clients, this involves collecting the client’s home and other personal contact information, employer and employer contact information, spouse’s name and date of birth, and taking a photocopy of the client’s Drivers’ License, Passport, Birth Certificate or other acceptable form of identification. For business clients, this involves collecting the name and contact information for the private organization, the type, status and business identification number of the private organization, the activity of the private organization, and all of the same information as noted above for all directors, officers, trustees and owners/shareholders owning a 25% or more interest of the private organization. In most cases, we obtain your consent to collect, use and disclose your personal information. Usually, if you retain our firm, we assume that we have your implied consent to our collection and use of personal information, however, at times we may ask for your express consent, either verbally or in writing. Generally, we collect your personal information directly from you at the start of or during the course of your retainer with our firm. Sometimes we obtain information about you from other sources such as a government registry or other professionals who serve you. For persons affecting our clients or for members of the general public, our primary purpose for collecting personal information is usually to gather and review information or evidence that is relevant to a legal matter or issue affecting our own clients (e.g., we are advising a regulatory body who provides us with information about their members relevant to the matter or issue; or, we are advising a municipality or authority who provides us with information about specific people living within its boundaries relevant to the matter or issue; or, we are advising a business client who provides us with information about their employees, clients or customers relevant to the matter or issue; or, we are advising an individual client who provides us with information about specific persons relevant to the matter or issue; etc.). Thus, the personal information is usually incidental to our providing advice to our client. Often this collection, use and disclosure is done without the individual’s consent because we are reviewing a policy, by-law or agreement, or an apparent breach of law, by-law or an agreement, or a claim or defense, etc., and obtaining consent would compromise the investigation or negotiation. Another primary purpose for collecting personal information about members of the general public is to provide notice of special events (e.g., a seminar, conference or reception) or to make them aware of legal services in general or our firm in particular. For example, while we try to collect work contact information where possible, we might collect home addresses, fax numbers and email addresses. We try to obtain consent before collecting any such personal information, but where this is not, for any reason, possible, we will upon request immediately remove any personal information from our distribution list. On our website, we only collect, with the exception of cookies (electronic markers identifying computers that have previously visited our website), the personal information you provide and only use that information for the purpose you gave it to us (e.g., to respond to your email message). Cookies are only used to help you navigate our website and are not used to monitor you. To advise clients and others of our legal services and/or new developments in the law. Our firm reviews client and other files for the purpose of ensuring that we provide high quality services, including assessing the performance of our partners and staff. In addition, external consultants (e.g., auditors, lawyers, information technology) may on our behalf do audits and continuing quality improvement reviews of our firm, including reviewing client files and interviewing our staff. Lawyers are regulated by the Law Society of Upper Canada, who may inspect our files and records and interview our staff as a part of its regulatory activities in the public interest. Lawyers are professionally insured through the Lawyers’ Professional Indemnity Company, who may inspect our files and records and interview our staff as a part of its claims management activities. In addition, as professionals, we will report serious misconduct, incompetence or incapacity of other practitioners, whether they belong to other organizations or our own. Also, our firm believes that it should report information suggesting serious illegal behaviour to the authorities (unless protected through solicitor and client privilege). External regulators have their own strict privacy obligations. These reports could include personal information about our clients, or other individuals, to support the concern (e.g., improper services), although we try to keep this disclosure to a minimum. Also, like all organizations, various government agencies (e.g., Canada Revenue Agency, Information and Privacy Commissioner, Human Rights Commission, etc.) have the authority to review our files and interview our staff as a part of their mandates (although, the solicitor and client privilege restricts their access to much of this information). In these circumstances, we may consult with professionals (e.g., lawyers, accountants) who will investigate the matter and report back to us. The cost of some services provided by the firm to clients may be paid for by third parties (e.g., legal insurance policies). These third party payers often have your consent or legislative authority to direct us to collect and disclose to them certain information in order to demonstrate client entitlement to and responsible use of this funding. In real estate purchase transactions, we will often arrange for the purchase of title insurance for our clients upon your express instructions, and the companies providing such title insurance products require certain information about the clients and the property being purchased. Clients or other individuals we deal with may have questions about the services they received. We also provide ongoing services for many of our clients over a period of months or years for which previous records are helpful. We retain our client information for a minimum of ten years after the last contact to enable us to respond to those questions and provide these services (the Law Society also requires us to retain our client records). If Kinder Law Office or its assets were to be sold, the purchaser would want to conduct a “due diligence” review of the firm’s records to ensure that it is a viable business that has been honestly portrayed to the purchaser. This due diligence may involve some review of our accounting and service files. The purchaser would not be able to remove or record personal information. Before being provided access to the files, the purchaser must provide a written undertaking to keep all personal information confidential. Only reputable purchasers who have already agreed to buy the organization’s business or its assets would be provided access to personal information, and only for the purpose of completing their due diligence search prior to closing the purchase. You can choose not to be part of some of these related or secondary purposes (e.g., by declining the receipt of information, or by paying for your services in advance, etc.). We do not, however, have much choice about some of these related or secondary purposes (e.g., external regulation). You may withdraw your consent to collection, use and disclosure of your personal information at any time, subject to legal and/or contractual restrictions and upon reasonable notice. Your withdrawal of consent to our collection, use and disclosure of your personal information may impact our ability to represent you and provide you with legal advice. Generally, we do not disclose your personal information to third parties without your consent unless permitted or required by applicable laws or court orders. The following are some examples where we may disclose your personal information: such disclosure is necessary to collect fees or disbursements; we contract with a third party to provide us with certain services. In such cases, we will use contractual or other means to ensure the third party service provider is bound by obligations regarding privacy which are consistent with this policy; or we engage expert witnesses or other law firms on your behalf. We use various safeguards to ensure that your personal information is protected against loss, theft, misuse, unauthorized access, disclosure, copying or alteration. These include: security of our physical premises; our professional obligations; security software and firewalls to prevent authorized access; and internal passwords that restrict access to our electronic files. We keep our client files for a minimum of seven years. Our client and contact directories are much more difficult to systematically destroy, so we remove such information when we can if it does not appear that we will be contacting you again. However, if you ask, we will remove such contact information right away. We keep any personal information relating to our general correspondence with people who are not our clients, newsletters, seminars and marketing activities for about two years after the newsletter ceases publication or a seminar or marketing activity is over.